I really felt like I sort of had it together yesterday for the first time in a long time. I shoved my omnipresent lazy in the corner for the duration of the kids' naps and dusted off my semi-productive pants for a boring date. I made a few baby blankets (shoddily hemmed the sides of two pieces of fabric ... totaling 8 whole straight lines of loving toil), altered a shirt (sewing the "dry clean only" tag right on out of the floppy collar just before its first date with the washing machine today ... so now Julia has a super cute maternity shirt that should fit until she thinks about eating), made some cookies and only burned two of the five sheets (batches? whatev), and put two coats of mascara on one eye. We got ourselves, the hemmed fabric, and the salvaged cooks into the car and onto the road to Mass at 5:14 only 9 minutes past the "we have to leave by 5:05" deadline and slid into the back pew reserved "FOR USHERS ONLY" just as the Gospel was starting. I like to always leave a little room for improvement. We'll tackle promptness in November (September and October are booked for "complain less" and "actually try to complain less"). I noticed that Julia's diaper was due to burst any second so I took her to the bathroom (that had short sinks! the better to aid Julia in soaking her bowlcut while I selfishly emptied my 1/8 tsp of a bladder) and by the time we returned the homily was .... over. I'm going to blame the world's shortest homily and not my futile attempts to dry Julia's hair with paper towels made out of super thin slices of what could only be described as cement cardboard. Sebastian's nose has come down with prolific faucet syndrome and being the responsible parent that I am ... I came prepared with exactly one baby wipe to help a brother out allllll throughout Mass. Not gross. We attended a friend's baptism following Mass where I suddenly realized Julia's dress was 8 sizes too large in the neck and was about as scandalous as a dress could be on a toddler ... revealing everything and nothing all at the same time. Sebastian laid a putrid egg that absolutely couldn't be ignored during the blessed event and Julia resoaked her hair with every holy water font that her little pawtips could reach. Yes, as I was feeding the kids and myself (Simon has recently mastered the important utensil utilizing milestone, thankfully) a late dinner of burnt cookies and frozen pizza followed by a large smoothie (to cancel out the unhealthy and ease my sugar crashing conscience) and reflecting back (oh, you don't reflect? it's all the rage ... I highly recommend it ... along with being passionate about something and taking some sort of symbolic journey to nowhere) on the day's events and realized that my "together" is "not" and that I had probably expelled all the energy I had reserved for the remainder of September on one half of one day. Sebastian resting his locks on a pillowy dishtowel while sucking down an Echinacea cough drop and Emergen-C dinner. Fooooooled him. Sneaky mom win - spirit fingers. Are those pterodactyl (the p is silent ... who knew?) claws where her crows' feet used to perch? Yep. I fell asleep on the couch while watching the big game with Simon and woke up determined to lower the bar and make today a little bit less stellar. And if the facts that we ate leftover frozen pizza for lunch, Sebastian smiled .01 times all day, I officially graduated to my larger yogajama pants, and Julia is currently jumping on her crib mattress and ask-demanding for her 99th drink of water at 11:27 pm tonight ... I'd say we totally succeeded. Toe touch! hahahaha, you are rad, you know that right? My heck you have a cute smile. 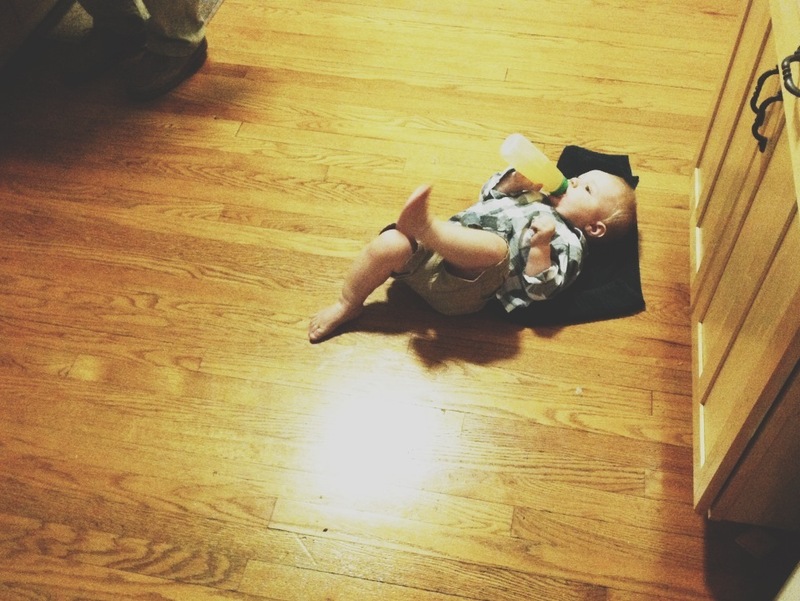 Love Sebastian lounging with his bottle, cute little legs. You weekend update posts are always my favorite thing about Monday mornings. In fact, if I were a career gal, I'd spend the morning prep, the stop at Starbucks and the traffic-jammed commute in giddy antici...........pation for the moment where I could enter my cubicle and click over to your blog. But I'm not a career gal, so all I have to do is roll out of bed, make myself a cup of sugary hot cream, and shuffle to the computer while the kids are told to "clean the toy room and remember what St. Paul says, 'He who does not work, does not eat'". Haha. As a "career woman" you totally nailed my Monday morning bed rising purpose. And the reason I make it to work only 15 minutes late instead of the norm 20 every single Monday! At least the game went in our favor, which hopefully made Simon sing happy happy joy joy, despite any swimming that may have occurred in the holy water earlier in the day. There were are lot of happy husbands and even happier (relieved?) wives around these parts. You make me laugh so hard. Toe touch! Grace, you are SO funny! You do a PERFECT job of explaining how it is with young children....and you do it in a funny and upbeat way. Your family is lucky to have you. Have you heard about the books, "If you give a pig a pancake" and "If you take a mouse to the movies"? A mom wrote a poem in that genra (sp) for mothers. I could guess it was you, but if not, you would do a GREAT job of making one! It's called, "if you give a mom a muffin". Google it - we can all relate. Keep writing. You are gifted! We actually made it to Mass ON TIME yesterday. Like before the procession and everything. I hardly knew what to do with myself!!! We didn't make it for the Gospel this week. I had to fill in and come up with some words of wisdom. We did sit through the homily though, and Ellen only talked through the entire thing. Gah. I need to go turn of toddler tunes. The beast has been sleeping for at least 10 minutes now. What fresh hell? Your church trips sound like outs except you're alone?! That's so hard. Do not know how you do that. No matter how early we try to leave we're always a few minutes late and there's hardly any seat left and people refuse to let us in their pew? They let us climb over them to go to the middle of the pew (dumb bc I can't tell you how many times we have to go to the back of church during Mass) so we have to climb over them multiple times.